HOW DO I GET STARTED IN BLACKSMITHING? I am asked this question more often than any other. And the answer is almost always the same. But lets look at the art of blacksmithing a little first. Blacksmithing is not all pounding iron, it is design, layout, cutting, drilling, joining, finishing, tempering, welding, brazing, tool making. . . Blacksmithing is almost ALL the metal working trades all combined. 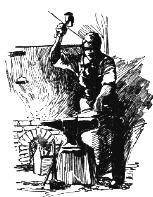 The blacksmith is one of the few craftsfolk that can, do, and are often required to make their own tools. I am not saying that blacksmith tools cannot be bought. There are more blacksmiths tools available today than there has been in nearly a century. Blacksmiths make their own tools because eventually every smith finds that his particular product or style of working requires his tools to be more specialized than those found off-the-shelf. Blacksmiths make their own tools for a variety of other reasons too. They often do it because they CAN. It gives a great sense of personal satisfaction to use tools that one has made to meet their own special requirements. Tool making is one of the highest skills of the metal worker. It requires a knowledge of both design and metallurgy besides the common metal working skills. The field of blacksmithing also has its own terms and jargon. Above I said, "blacksmithing is not all pounding iron". Here the term "iron" is being generically used to describe what is most commonly steel but in the past would have been "wrought iron". In most cases the term "iron" commonly refers to "cast iron" which is not forgeable and is cast in molds. However, in smithing "iron" is understood to be whatever ferrous material you have heated in the forge and will be pounding on. The term "wrought iron" is used as an adjective to describe any decorative ironwork. But "wrought iron" is also a noun describing a specific ferrous material that is generally no longer available. Being a very old trade the language of blacksmithing is often confusing. Typical of the English language there are often more than one meaning for a word and more than one word to describe the same object. On the anvil above the pointed ends are called the bick, beak and horn. All having the same meaning. The above is NOT an attempt to discourage you but to make my point about blacksmithing not being all pounding iron. Your scope of study will be wider than what you may have thought. How old do you have to be to learn blacksmithing? There is no minimum age other than that required to do business (18 to work full time). To learn as a hobby you just need to be old enough that your parents will let you work with hot iron and light a fire. I have taught young people when they were only 8 years old. We recently worked with a group of Boy Scouts for the Metal Working merit badge (minimum age 11) and I worked with ONE fellow that was in the Cub Scouts (age 9 I think). I believe age 8 is about the minimum age that one is mature enough to start smithing. I recommend the following as a self study course. 1) IF for a serious hobby or profession, sign up for a welding course at your local community college or trade school. Oxy-acetylene (gas) welding comes first. Here you will learn the important safety rules for handling welding cylinders and the safety equipment used when handling hot metals. Even if you never have gas welding equipment in YOUR shop you should know how to properly operate it in a studio or some one else's shop. You would be am mazed how many "blacksmiths" don't know how to light a torch! If you learned to use this equipment "on the job" please go back to school. 2) Purchase the following texts (reviews on our Book Shelf). 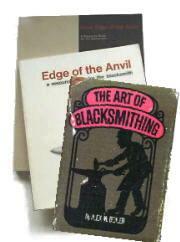 The (new) Edge of the Anvil by Jack Andrews, The Art of Blacksmithing by Alex Bealer. And if you are interested in Blacksmithing as an art form, Decorative and Sculptural Ironwork by Dona Z. Meilach. There are also good blacksmithing subscription publications. Is no longer in print but the archive of this publication's web site by Fred Holder has how-to articles on a wide variety of subjects and lists sources of tools and materials. A CD will be available with back issues in PDF format. A beautifully illustrated magazine by George Dixon the first editor of ABANA's Hammer's Blow. As the title states the subject is traditional methods of joinery and forge work. Continue your welding courses if you are taking them, start to look for equipment and scraps of steel to experiment with or to build equipment from. Be imaginative. Don't get stuck on setting up a classic 19th century shop! There are plans posted here for all type of tools and equipment that almost anyone can build. See our plans and iForge pages. Follow the links on this page. 4) Take the second part of the welding curriculum you've started (arc welding). By now you may have some ideas about something you want or need to build and using the school's equipment is a great way to do it WHILE getting educated. Arc welding may not have any place in classical blacksmithing but the equipment is cheap and it is the fastest and most economical way to put two pieces of steel together when building equipment, jigs and fixtures. Then, join ABANA, find a local ABANA-Chapter and join that, assemble your shop, try to meet other blacksmiths (this is your best source of tools). As part of your ABANA membership you will receive The Anvils Ring and The Hammers Blow, publications full of good current information and how-to articles. THEN, DO IT! While joining organizations please consider CSI, Our non-profit that supports THIS website. Our iForge page has hundreds of step-by-step projects. Some are more difficult than others. Jack Andrews' book has simple exersizes that will get you started. IF you are one of those that doesn't learn well from books, use the contacts you've made. I have never NOT taken the opportunity to stop what I am doing to give someone that first lesson and I have never met another smith that wouldn't! If that fails there are several Blacksmithing schools you can attend (check the ABANA page). 6) This could have been #1! If you are serious about learning blacksmithing you should go to the next ABANA, BABA, CanIron (or nearest) blacksmiths conference. ABANA and CanIron are held every two years (alternating so there is one in North America yearly). There are also your local ABANA chapter meetings often held in local blacksmith shops where you can also learn a LOT. Some of the larger local conferences such as Spring Fling or the South East Conference rival CanIron and are as big as an ABANA conference 10 years ago. See the anvilfire! NEWS for our coverage of these events. JOIN! that local ABANA-Chapter. They are the best fastest education in blacksmithing and metalworking you can get. See our Calender of Events page for schedules of events world wide. Find a job doing anything in the metals trades. Be the gopher or clean up man for your local machine shop. You don't have to be a machinist to see and learn from what is going on. Work in a steel service center wharehouse (they might let you put that welding education to work cutting plate). Work for a railing fabricator. Most of these guys don't do much forging but they turn out the majority of architectural ironwork in the US. Any job that gets you close to heavy iron will educate you in many of the things you only learn by experience. 8) Its your life. Figure out what you want to do with it. If you are interested in blacksmithing as a hobby there is none better. If you are interested in a carreer then study it closely, research the market. If you prefer to be taught rather than teach yourself there are many blacksmithing schools in the US such as Turley Forge Blacksmithing School in New Mexico and general crafts schools such as John C. Campbell and Penland in NOrth Carolina. These will start you right off learning how to use a coal forge, forging iron and making welds. For those that do not learn well on their own or can afford to go these are great places to learn blacksmithing. The most important tools to the blacksmith in order of importance, hammer, anvil, forge, vise, tongs. There are on-line blacksmith tool catalogs with hundreds of photos: See the Blacksmiths Depot website has the best photos. See also Centaur Forge and Blacksmith SUpply and our other advertisers . Anvil - A 100# or greater anvil. There are alternatives but most are marginally satisfactory (such as heavy railroad rail). A blacksmith's anvil is usually their first expensive tool. Good used anvils are not easy to find but it CAN be done if you are persistant. Read all the information about anvils on our 21st Century page before you go shopping for used anvils. Avoid buying anvils (or other tools) on ebay until you have some knowledge of the tools and the traps of doing business on ebay. See Selecting an Anvil. Forge The forge may actually be the blacksmith's most important tool but because there are so many ways to make them they are not difficult to obtain. Because of this they are also the most variable piece of blacksmithing equipment. Fuel can be charcoal, bituminous coal, oil or gas. 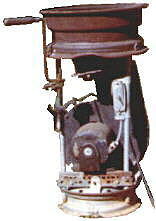 Forges can be of elaborate construction or built from junk (see forge above) or the plans for a brake drum forge. DO NOT get stuck on some idealistic 19th century vision of a forge. Look at the various forges on these pages. Almost all of them are different yet they all work! Tongs - Can be purchased but I recommend you make a few pair for the experience. Long handled Channel-Lock pliers can substitute and so can Vise-Grips. Did you know that Vise-Grips were invented by a blacksmith trying to make better blacksmith's tongs? NOTE: Vise-Grips actually make lousy tongs except for very small work OR odd billets and should only be used until you make a couple of pairs or REAL tongs. Real tongs don't require tongs to make, except perhaps installing the rivet if you heat it in the forge. There are instructions for making tongs by several methods on our iForge page. Safety glasses, good ones with side shields. Always wear the correct welding hood, shield or goggles when welding. A leather or heavy canvas apron, these can be purchased at any welding supplier (along with gloves, eye and ear protection). Gloves - Numerous types are available. The half leather canvas work gloves such as those made by Mule and others are comfortble, inexpensive and my prefered work glove. They are good for all types of shop work including light welding and forging. Kid leather gloves made for TIG work are popular among smiths. Due to wearing one glove on their tongs hand for hot work most blacksmith suppliers sell individual left and right hand gloves. Hearing protection (optional but highly recommended). Shop noise varies a great bit and many smiths blame anvil noise on hearing loss. Always wear 100% cotton when working with fire or hot materials. Most synthetics are flamable and melt, adhearing to the skin as they burn. Steel toed shoes/boots are not necessary in a small shop with few heavy items. However, you can easily break a foot or crush toes if an anvil or swage block (common blacksmiths tools) falls on your feet. As soon as you get into having lots of heavy items in your shop they are a good idea. Get a copy of Machinery's Handbook, Published by industrial Press, $75 new ($25 used), and read it! The older the better. Machinery's is written for machinists and draftsman but should be read by all engineers and studied by every other metal worker. This book includes everything from mathematical tables to how to sharpen a drill bit. The section on steels and heat treatment is worth the cost of the book. AND, Yes there is a section on forging (editions earlier than 23rd) and welding. ANOTHER GREAT BOOK! Otto Schmirler's Werk und Werkzeug des Kunstschmieds (Work and Methods of the Artist Blacksmith). This book has the finest illustrations of tools in any book on blacksmithing. Schmirler's book has text in French, German and English but its not needed due to the beautiful illustrations. Remember, Machinery's Handbook FIRST! (after the general references) - Future bladesmiths, this is just the TIP of the iceberg of technical reading you SHOULD do! Those of you looking for early editions or out of print books, these are the best places on the web. If you are seriously looking for something, keep checking every week. Each book seller that lists their books here are continously updating their inventories. 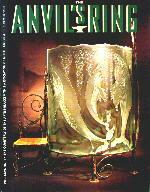 Previously we recommended Bibliofind here. However, they have been bought by Amazon books and the quality of the listings is no longer what it was. If you are to do any welding of any kind I serriously reccomend that you plan on attending a welding class or three and paying attention. There are far too many safety hazzards not to learn the RIGHT way. I am also getting tired of writing letters to the wives of professional welders that want to know what is wrong with their slowly dying husbands that have heavy metal poisioning. There is no cure. Death is slow and painful. If they had learned to weld in a classroom rather than on their own or on-the-job they would have or SHOULD have, known what to avoid. So you want to make a Sword? Sword making for newbies. Where to Buy Steel You can only fo so far using scrap metal. ASO's on ebay Dealer Fraud - avoid getting stung on ebay. My First Forge, built from junk. Brake Drum Forge Plans. A low cost starter forge. Selecting an Anvil. Types, sizes, construction, links to other articles. Tongs Dimensions Chart Courtesy of Industrial Press (with permission). FAQs Frequently Asked Questions page, includes the links below and others. testimonials What users have to say about anvilfire.com. Write or call for a brochure and schedule. Click link for details.